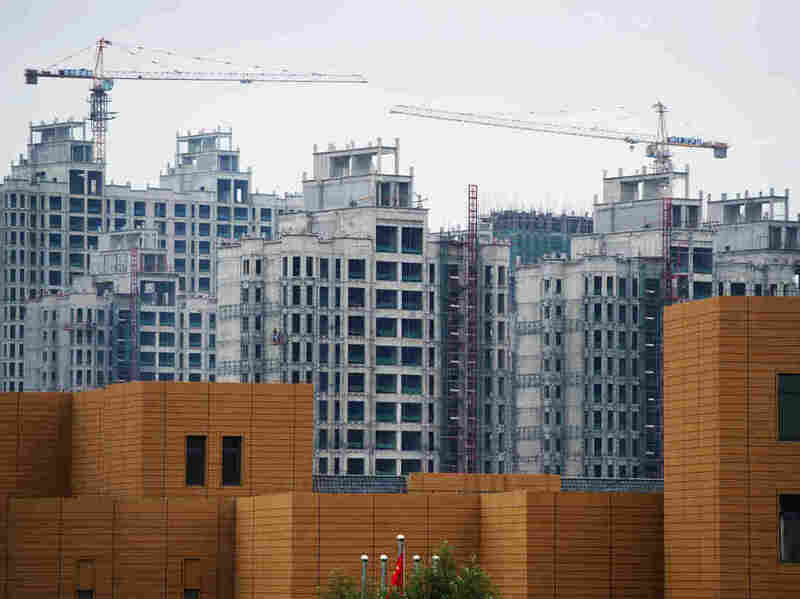 China's Ghost Cities Were Hidden Until Now : Goats and Soda The locations of the infamous empty housing complexes have been secret, but ghost city hunters are now using smartphones and GPS receivers to track them down. Modeled after Manhattan, Conch Bay is a massive development project in northern China. But at least for now, it's more ghost town than bustling metropolis. Built it and they didn't come. 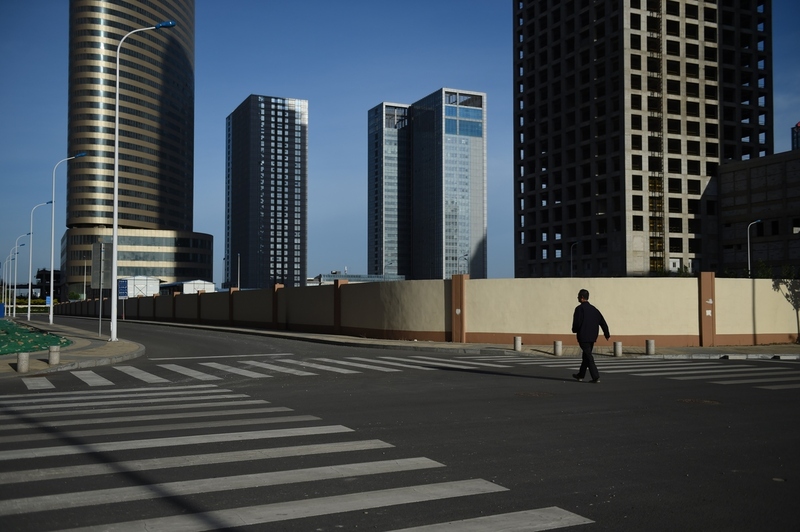 That could be the motto for China's infamous "ghost cities" — vast housing complexes that were frantically erected over the past decade but remain largely uninhabited. For years, the real estate market in China has been booming. Chinese laws allow city governments to cheaply grab nearby rural areas for development, and that's fueled the frenzy to build, build, build. Over the past 20 years, the country's urban areas have quintupled. Amid this real estate race, some developers misjudged demand and couldn't get people to move in to new housing. When NPR's Frank Langfitt visited one of these eerily empty developments last month, he said it resembled "an abandoned movie set." Spooky, indeed. Construction of Ordos in Mongolia was completed in 2010. It was designed to house a million people — but residents didn't come. Both local and international media have been murmuring about ghost city sightings for years, and real estate developers and economists have been speculating over these specious beacons of urbanization. But no one has figured out the scope of this phenomenon or tried to track down all of these empty developments. Baidu, a tech company that dominates the Web and mobile app market in China, realized after conducting some research that it could put to good use data collected from its products. Baidu used location data from smartphones and GPS receivers to map out where people were — and weren't — living. "We had data from about 70 million users," says Haishan Wu, a data scientist at the Baidu Research Institute. The researchers then looked for residential areas that were sparsely populated. Housing developments filled to a quarter capacity or less were identified as ghost towns. By tracking how people moved in and out of cities over a period of six months, Baidu researchers were able to distinguish between ghost cities and vacation towns that empty out and fill up seasonally. "We then confirmed our data with the Ministry of Housing and Development and real estate websites," Wu says. Many of these deserted developments have apartment buildings and not much else. Hu's hunch is that people don't want to move into neighborhoods that lack schools, hospitals and shopping malls. "Maybe the decision makers, when they were planning, should have considered these things more," Wu says. "Now that we know where the ghost areas are, we can try to identify why these areas are 'ghostly' and do something about it." In fact, Baidu has released their "ghost maps" for only 20 Chinese cities. The company is looking to sell the rest of this data to real estate companies, Wu says. "I think this will be a very useful tool," says Dali Yang, a political scientist at the University of Chicago who wasn't involved in the Baidu research. "Before, developers would sometimes resort to counting how many windows were lit up at night. It wasn't very accurate." China isn't the first or only country that has overbuilt and ended up with dud developments. But how come we don't come across as many ghost towns in countries like India and Brazil — which have experienced nearly as much economic growth and urbanization as China over the past decade? It has a lot to do with the fact that China's municipal governments own urban areas, Yang says, and can cheaply buy up rural land outside their jurisdictions. "Then they can auction off this land with a huge markup," Yang says. "So cities, and the officials who govern them, have a very strong interest in promoting real estate development." For local officials, there's prestige to be gained from spearheading huge real estate projects. "There's no denying that in certain cases, officials will award development rights to their friends," Yang says. In India or Brazil, it is much harder for developers to acquire and develop land, he says, and that may be a good thing. "There's been this huge real estate boom in China for a long time now, and that's starting to slow down," he says. "That could have a ripple effect on other industries like cement [and] steel as well as the home furnishings industry." But ghost cities aren't necessarily an omen of gloom and doom. Yang says that over time, these areas might grow into thriving places. Kenneth Rhee of the Urban Land Institute, a nonprofit that researches urban planning strategies, is optimistic. "I wouldn't conclude that ghost cities are a very serious problem," he says. "Things can change very quickly." Besides, there could be another, more banal explanation for why people aren't flocking to these new developments. "Most of these housing developments are built as bare shells," Rhee says. They don't have any appliances, or even toilets — just concrete walls. "If you go back 10 years, there was a huge shortage of housing," he says. "So developers were less concerned about the quality of the housing unit and more concerned about just putting a roof over peoples' heads." But these days young Chinese professionals don't want to spend a bunch of time making their apartment livable. They want apartments that are move-in ready. So if developers can amp up the amenities, Rhee says, maybe they can exorcise ghost cities for good.